Are you familiar with celery root? It’s also called celeriac and it tastes like a cross between celery and parsley. It’s starchy like other root veggies and makes a really fantastic substitute for mashed potatoes (no, really!). So if you’re looking for a low carb alternative, celery root is it! Although this amazing vegetable offers a lot to write home about in terms of taste and nutrition, it’s one of the less attractive veggies at the market and for that reason, it’s often overlooked. This vegetable gives new meaning to the phrase, ‘don’t judge a book by its cover.’ It’s shaped like a globe and has this gnarly, uneven and brown appearance – it reminds me of something straight out of Harry Potter 😛 (take a look at the photo and you’ll see what I mean!). On the inside however, this veggie is creamy, white and aromatic – just beautiful. Once you’ve tasted it, you’ll kick yourself for not having tried it sooner. Celeriac is rich in dietary fibre which is essential for maintaining proper digestion. It helps keep everything moving, if you know what I mean 😛 It’s also a good source of Vitamin C and fantastic for helping to strengthen the immune system, especially this time of year (hello cold n’ flu season and cold weather!). Ok, back to the mashed potatoes talk! When you’re on an AIP diet, the comfort of the white potato is off limits to you. White potatoes are part of the nightshade family and many people who have autoimmune conditions have trouble with them. That’s why it’s invaluable to have substitutes like celery root to lean on when you have these dietary restrictions. 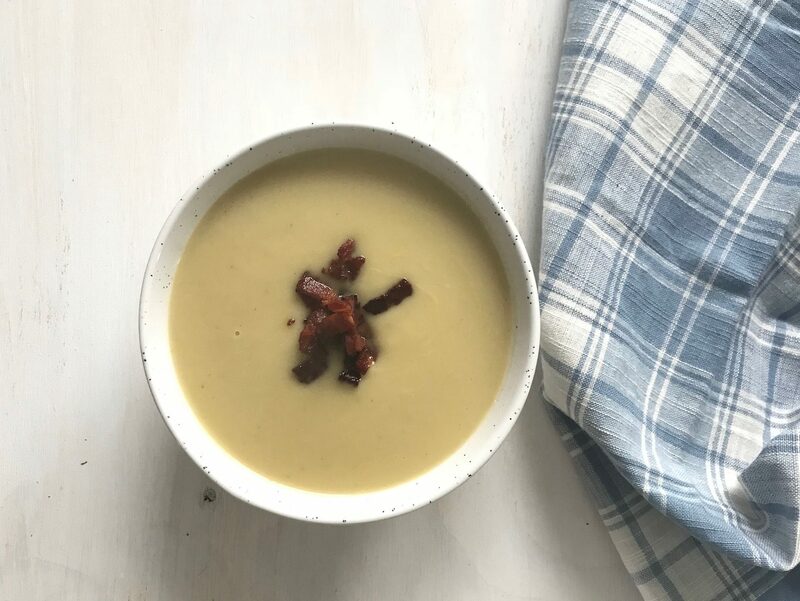 You can turn this unassuming veggie into a gorgeous puree or mash to help satisfy that carb craving. Let’s talk about this soup now. It’s rich and savoury. Luxurious in texture. And adding the cooked bacon bits on top just adds some much needed crunch. Enjoy! We want to know –> what’s the most challenging part of following an AIP protocol for you? Share with us in the comments below. Cook bacon as you normally would. Drain on a paper towel lined plate. Chop & set aside. In a large soup pot, warm olive oil over medium heat, add sliced leeks, celery root and celery. Cover and cook for 20 minutes. Stir in broth. 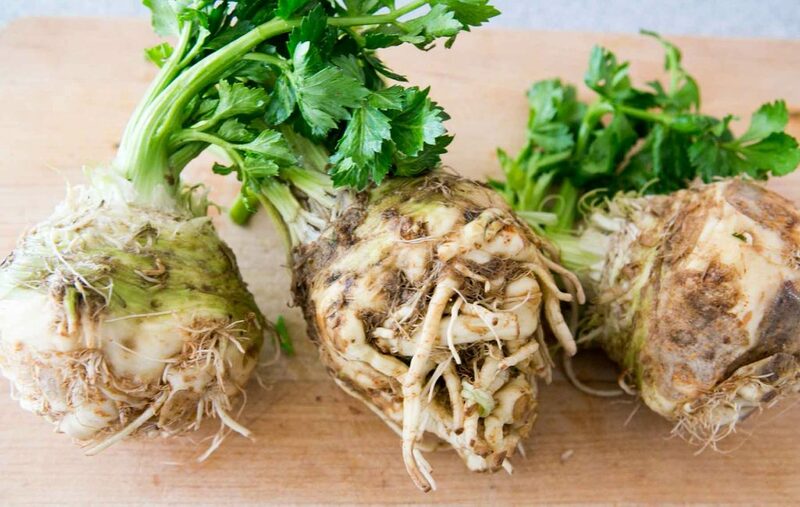 Bring to a boil and reduce to a simmer for 10-15 minutes or until celery root is fork tender. In batches, carefully blend soup mixture (you can use a hand immersion blender or your blender). Add the blended soup back into the pot and stir in coconut milk. Season with sea salt. 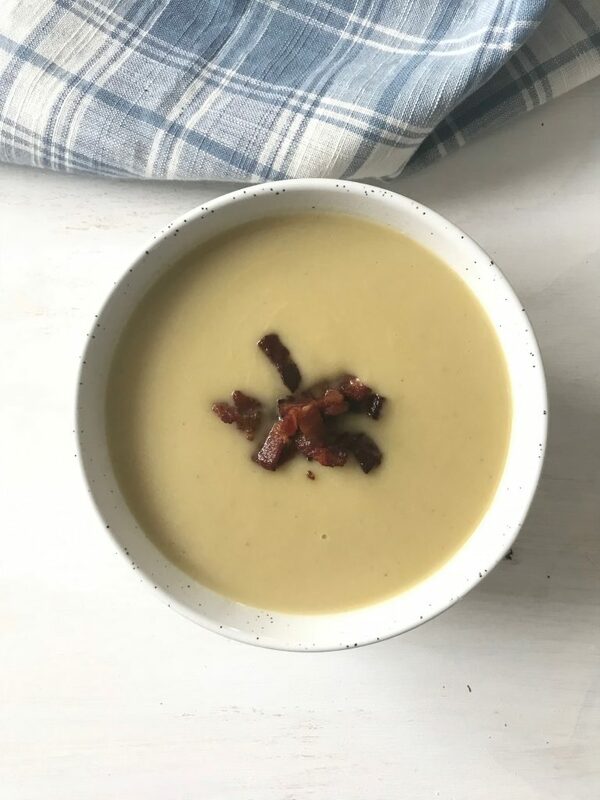 Portion out soup and garnish with chopped chives and bacon. *If you are NOT on the AIP protocol, feel free to add in some fresh black pepper.